Another What's On The Ceiling shot from Chicago. I'm not the first to have made one like this, I bet. This is the second stained glass dome in the Chicago Cultural Center, formerly the Chicago Public Library, done by Louis Comfort Tiffany. You may have heard of him. When Tiffany was selected for this project, he had just finished redoing several rooms in the White House for President Chester Arthur. • The Tiffany Dome is 38 feet in diameter. • 30,000 pieces of glass fill its cast iron frame. • It is the world's largest Louis Comfort Tiffany glass dome. • Only about 2% of the glass pieces had to be replaced in the restoration project. 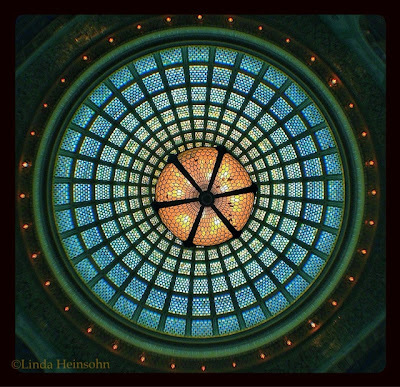 Beautifully documented, Linda. Must have been unbelievable in person. Thanks for the photo.